Kelly, a 1978 Samford business graduate, was speaker for the May 12 commencement ceremony, one of seven being held at Samford this spring. Kelly is a managing director for CoreLogic Inc., Westlake, Texas. Kelly offered graduates three keys that they could use to unlock a successful future. The first key is for them to “own their future and to define what success means to them.” She added, “Just like your DNA, it [success] will be unique to you.” Kelly also told graduates that there will be accidents and detours in their lives, but if they know where they are going and their destination, they will be put on the most direct route. Her second key to success is “always wear your best cowboy boots.” She stated that leadership is profound in that people will pay attention to what you say as a leader. In addition, she told the students that they must protect their brand. Kelly reiterated to the graduates that they cannot live someone else’s brand. They have to live their own. In her third key, she told the students to find their passion and to “find their bluebird.” According to Kelly, bluebirds are symbols of happiness, prosperity and new birth. Kelly closed her remarks about how to face adversity with the story of the Garden of Gethsemane. She told students that it was a bad day for Jesus, and he knew he was in his final days. Jesus had been betrayed, but he continued to demonstrate courage and forgiveness, and, even in this bad time, nothing would take him off course. The lesson is that students must have courage and grace, but also have faith in power. “Jesus gave us the power to put his armor on, and that armor can strengthen us every day,” she said. 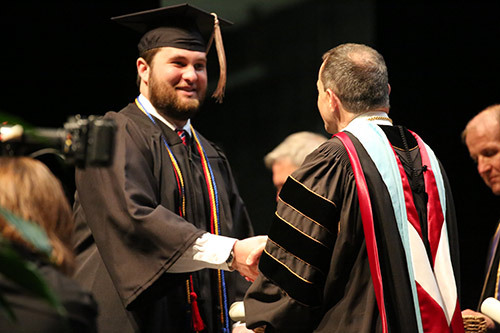 After students were awarded their degrees, Samford President Andrew Westmoreland presented a posthumous degree in finance to Brock School of Business faculty member Darin White for his son Avery, who died unexpectedly Jan. 30. Corey Storrs White, a marketing major from Vestavia Hills, Alabama, and brother of Avery White, was awarded the university’s John C. Pittman Spirit Award, which recognizes a graduating senior who has exhibited a serious commitment to being a student and achieving academically, to honoring Christ, to personal health and involvement in student life.